Glitter tattoos are a fun way to bring unique entertainment and style to your event! They can be added to any of our Face Painting and/or Balloon Twisting services. 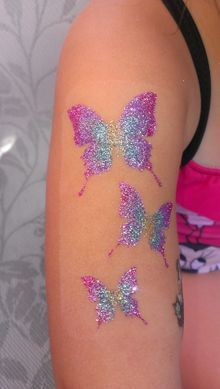 Our glitter tattoos are water proof and typically last up to 5 days. We have over 100 designs in our catalog currently and we add new ones all the time. Click here to see prices and to book your event! Dynamic-Faces also specializes in henna tattoos. Our henna is 100% natural with no artificial dyes. Henna typically stays visible for up to 2 weeks. These long lasting tattoos can be completed at a rate of about 12-15 tattoos per hour(depending on complexity). Large custom henna designs can also be done. See our prices page for more information.